These days, even if you are living in a small house, you can still get everything you want because of good planning in design and layout. There are many small houses and apartments that have impressive layouts and have all the areas that the owner wants as well as some perks that make living a lot more fun and comfortable. 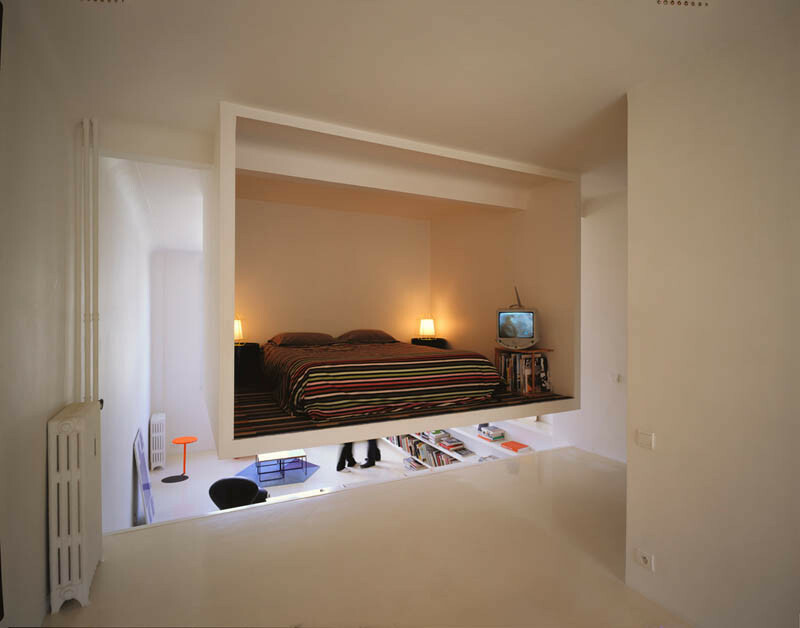 Remember how bedrooms are added in small apartments in creative ways? We have another idea for you today in a small apartment with just 50 sq. m. floor area. 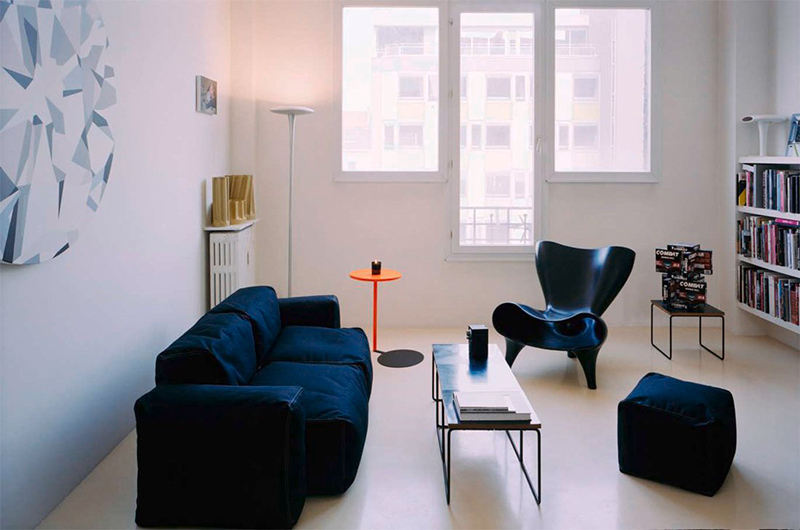 The interior of an apartment is designed by Parisian architects Emmanuel Combarel and Dominique Marrec of ECDM. The apartment has a bedroom that is suspended inside a cube within the center of the apartment. 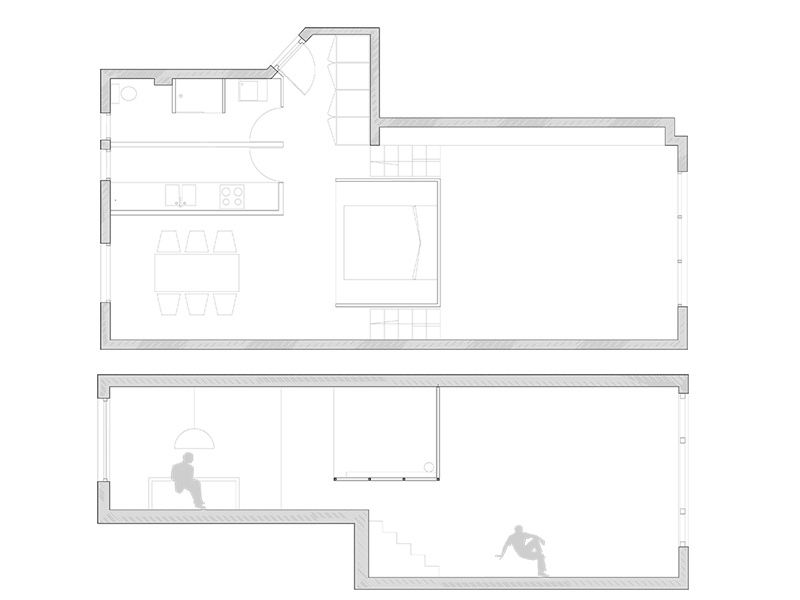 The strategy of the apartment is to decompartmentalize the place so it could “fit out an open plan and elude the demand of an extra room by conceiving in the center of the volume a suspended white cube which generates comic and disconcerting use situations.” The space is a former artist studio that has a difference in height from a simple to a fake double height, with 3.70 m under ceiling in the main room that has been originally marked by an awkward mezzanine. Well, the designers, made use of the space by adding a hanging bedroom in it. Let us take a look at the interiors below. Unique feature: A small apartment was designed with a suspended bedroom which is an interesting element in the area. The 50 sq m apartment update faced different challenges like the variety of orientations, volumes make possible unusual, and uncommon living situations. But if you look at this, they were able to overcome it all with a new beautiful design. The suspended box that you can see here is made of a metallic structure with section 40 x 40 mm that is covered with wooden panels. The floor, walls and the ceiling of the cube has been painted with a white polyurethane resin. The owner wanted to add an independent bedroom in the house but doesn’t have enough space to do so and this was the solution. 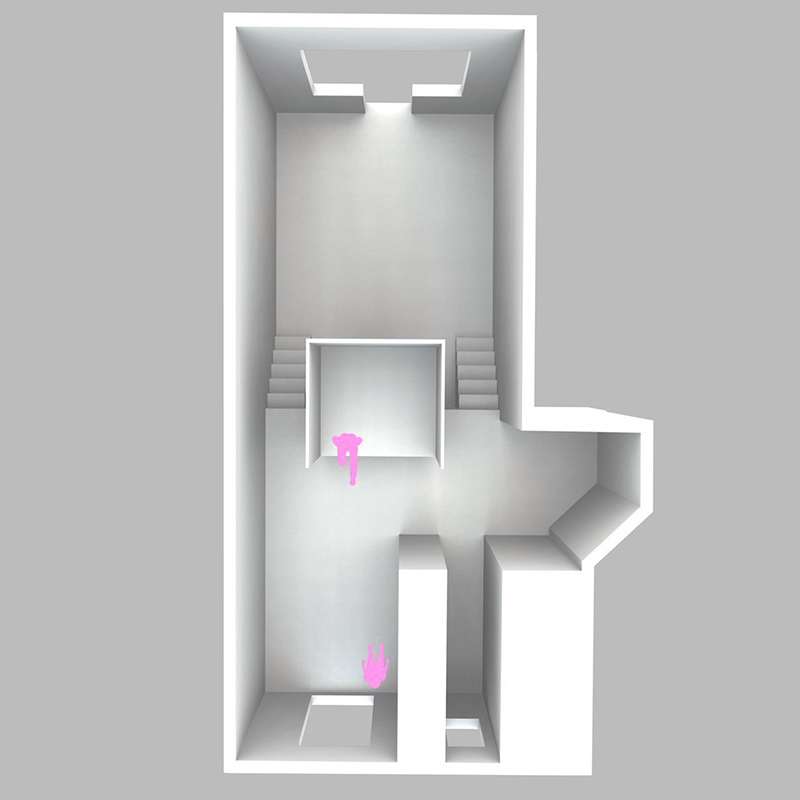 An intermediary room is placed in a central position, straddling the two floor levels and is disconnected from the floor. The bedroom “connoted as the archetype of privacy, intimacy, becomes an object of curiosity by transgressing his symbolic value, appearing like an anomaly.” When one opens the entry door, the cube will be visible but it appears like inhabited furniture that faces the dining room. Another setup of the space showing us the living area with an eclectic mix of furniture. Notice that the windows allow natural light to get into the space. Looking good, right? 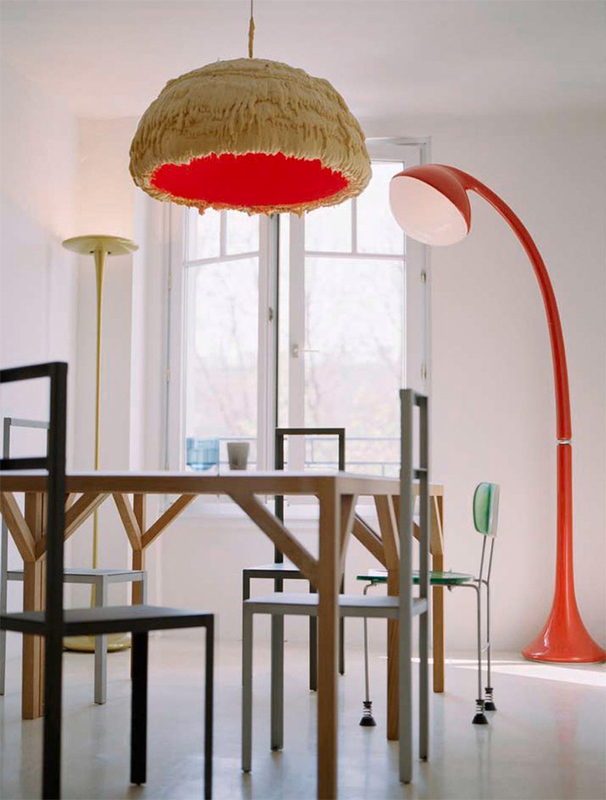 The dining area has creative lightings and an eclectic mix of dining chairs. You can see here that aside from having different designs of the chairs, the lights are also lovely which adds a creative touch to the space. 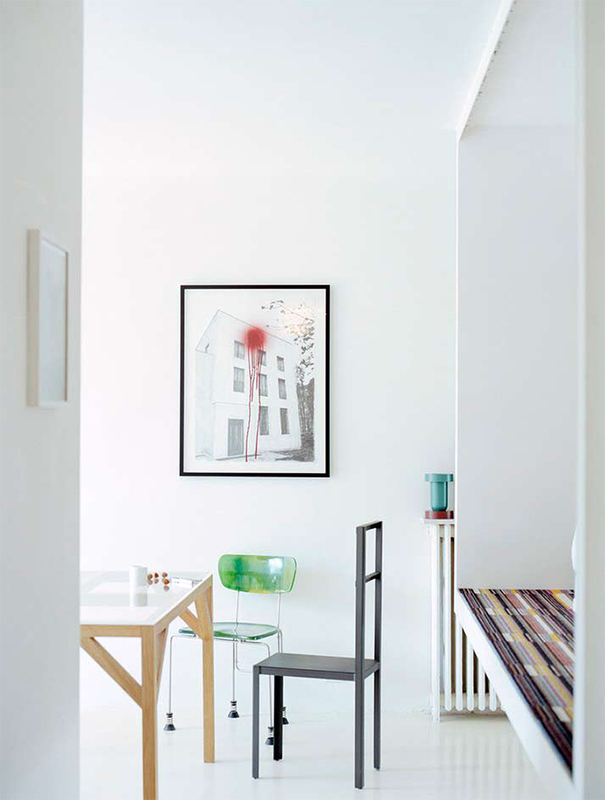 There are many beautiful elements in the small apartment that made it cozy and even interesting. Notice the design of the chairs, the wall decor and even that countertop with mosaic design. As the box is suspended right in the center of the apartment, the floor is untouched and it divides the space, reversing the perception of the atmosphere. With that box in between the steps, the living room appears a private space. 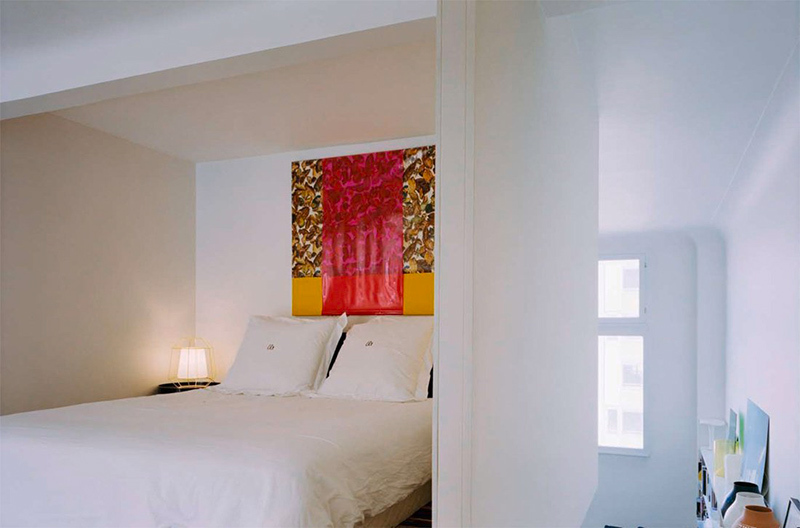 Seen here is a different approach on the design of the bedroom but it is the same space. The bedroom becomes an islet in the heart of the apartment where one can experiment different moods. The bedroom’s design can be updated from time to time. Since it is just open, it is important that it is tidy and well-designed all the time. Seen here is a shelf that is full of books. Above the shelves are jars, paintings and other decors that add beauty to the area. Look at all those books! A 3D presentation of the apartment. The cube for the bedroom can also be used as a bench or a bum rest. Notice its unique shape too which could have been a challenge for the owners. When one stands below or above the box, it truncates the perception of the occupiers bodies wherein one can only see the legs sitting, crossing or walking around in the place. This is the floor plan of the apartment. You can now see how the areas are being distributed. On the elevated part where the box is, you can find the bathroom, kitchen, and dining. Isn’t this lovely and unique? It sure is! Since we spend most of our time in the bedroom, it is important that we place it in a spot where you can spend time alone, enjoy great moments or even bad moments too. No wonder that bedrooms have exciting designs because it is a special part of a house. The apartment design is done by Emmanuel Combarel and Dominique Marrec of ECDM and with the looks of it, they indeed did an amazing job. 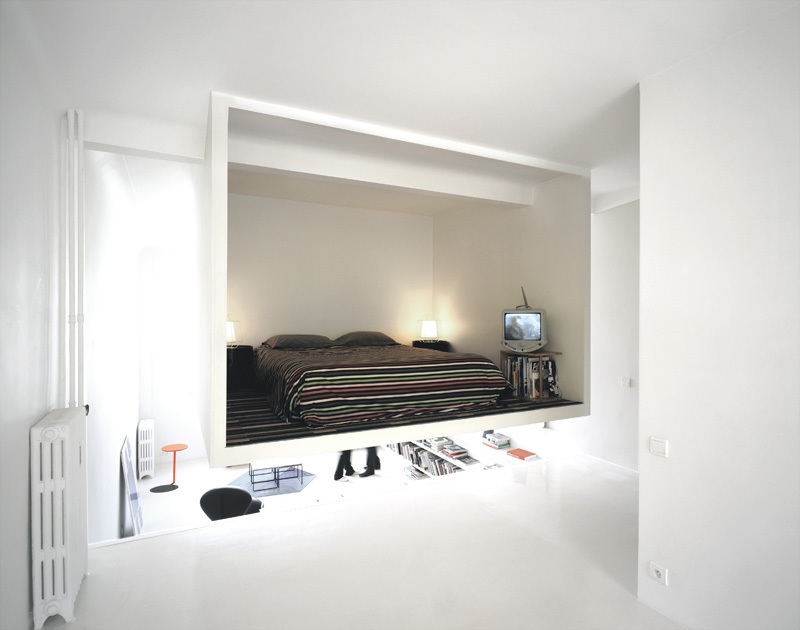 I like the idea of having a suspended bedroom like the one in this apartment. How about you, how do you feel about this apartment?